Conquer cancer with the Jimmy Fund Walk! 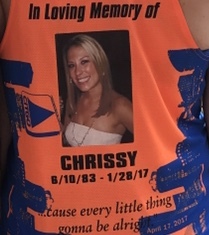 Chris and I will once again be running in this year’s Boston Marathon as members of the DANA FARBER MARATHON CHALLENGE TEAM in memory of our sister-in-law Chrissy Fields Cedrone who passed away on 1/28/17 after battling stage IV metastatic breast cancer. This will be our 3rd year as members of the DFMC TEAM and are planning again to surpass our fundraising goals. In just 2 years we have raised over $30,000 with the help of our families, friends and colleagues. This year we have set a steep fundraising goal and will work tirelessly with the help of our support systems to achieve it.